Opis: Bright clusters of stars form and disperse near the center of our Galaxy. Four million years ago the Quintuplet Cluster, pictured above, formed and is now slowly dispersing. 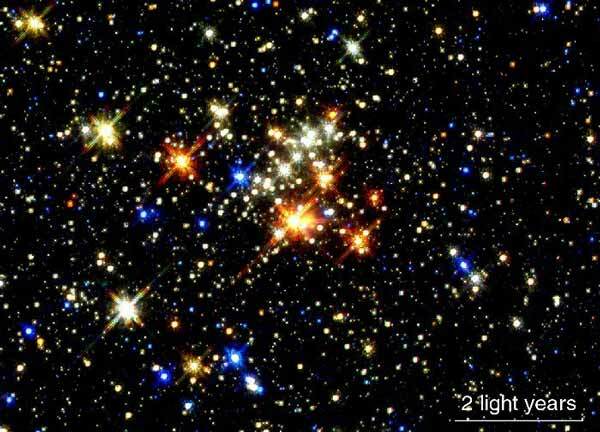 The Quintuplet Cluster is located within 100 light-years of the Galactic center, and is home to the brightest star yet cataloged in our Galaxy: the Pistol Star. Objects near our Galactic center are usually hidden from view by opaque dust. 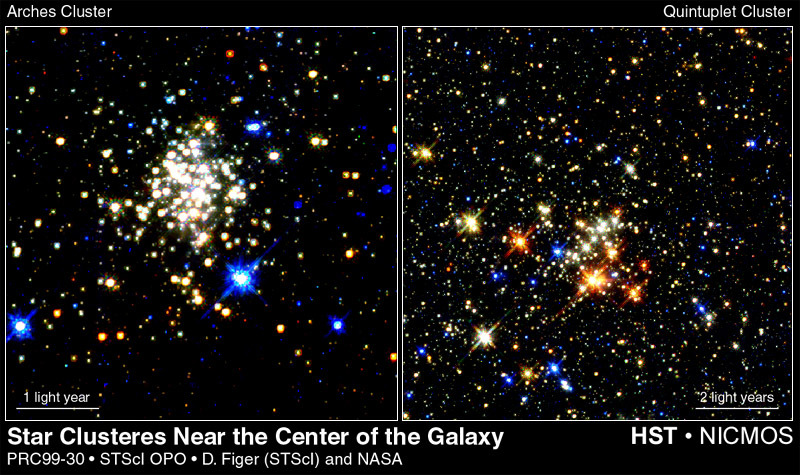 This recently-released picture was able to capture the cluster in infrared light, though, with the NICMOS camera onboard the orbiting Hubble Space Telescope. The young Quintuplet Cluster is one of the most massive open clusters yet discovered, but still much less massive than the ancient globular clusters that orbit in the distant halo. Some of the bright white stars visible above may be on the verge of blowing themselves up in a spectacular supernova.